Perception is not a passive process of registering the world. Rather, the brain can make use of prior knowledge to actively predict possible future states. This can help to make sense of the incoming sensory signals and make quick and accurate decisions. The Predictive Brain Lab sets out to understand how our brain uses prior knowledge to aid perception and decision-making processes. We showed that early visual cortex performs pattern completion by recreating a stimulus sequence after only a subset of the visual sequence is provided. Interestingly, this ‘pre-played’ sequence was temporally faster compared to the actual sequence and linked to behavioral performance during perception. Ultra-high resolution fMRI allows for functional data to be acquired from separate cortical layers. Using knowledge of the layer-specific terminations of feedforward and feedback connections in visual cortex, we use this to separate top-down from bottom-up visual responses. 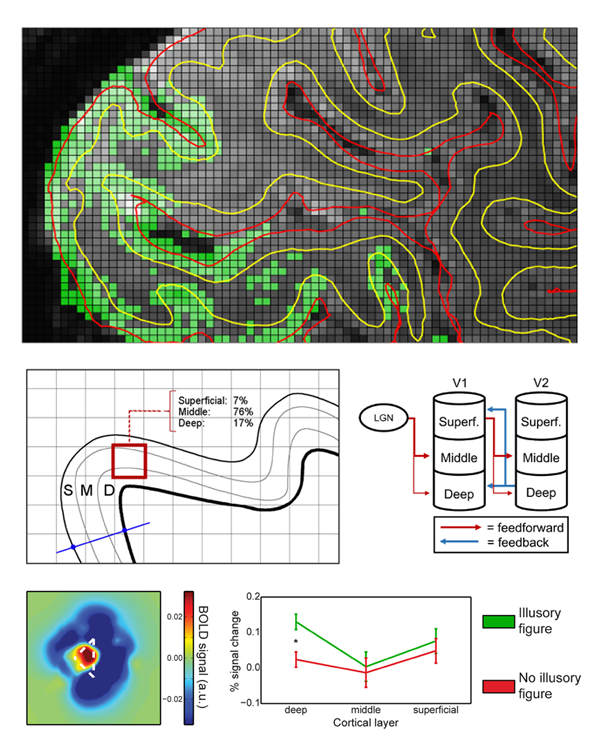 For example, increased fMRI responses to an illusory shape stimulus from top-down feedback are only found in the deep layers of V1. Here, we combined human magnetoencephalography (MEG) with multivariate decoding techniques to resolve the timing of neural signals induced by expectations. 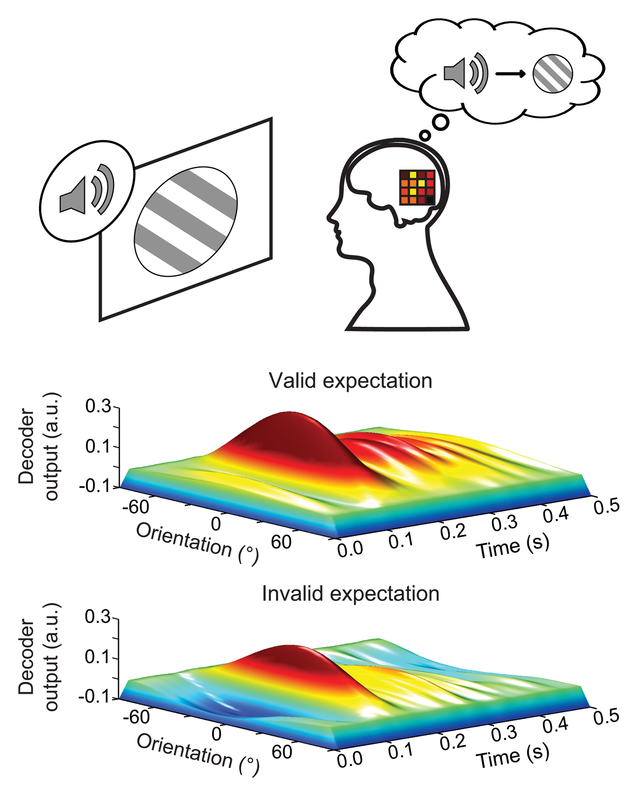 We found that, when auditory cues induced the expectation of a grating of a particular orientation, this evoked a neural template of the expected grating already before the grating was presented. These results suggest a mechanism by which the brain predicts future sensory stimuli in order to enhance perception.